Hello everyone! I hope you are having a wonderful Sunday! Today's Stampin Sisters in Christ Challenge was chosen by Randi, and is based on Ex. 20:12 "Honor your father and Mother, that your days may be prolonged in the land which the Lord your God gives you." What a great verse! It's the one commandment with promise! We live in a day where children often don't respect their elders, and seldom "honor" them... but God must put GREAT importance on it! 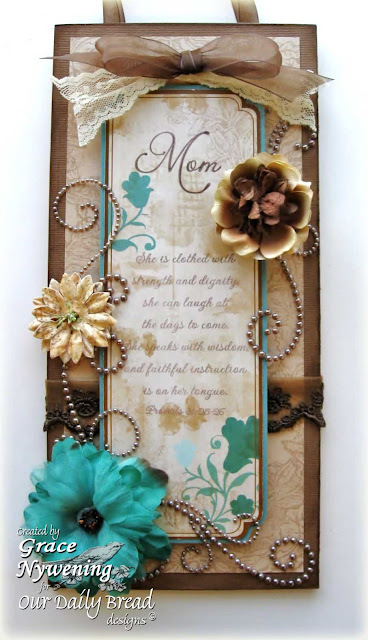 Randi is challenging us to make a card or project for our Mom or one who is like a Mom to us. My Mom is in heaven, but I do have someone special in mind for this... I hope she will like it. Instead of making a "Mother's Day" card, I made a wall hanging that honors Moms. I used Our Daily Bread designs "Mom" set. I really went green on this project too. The wood base for my wall hanging is a left over piece of kick plate from our kitchen cabinets. The panel that I stamped on came from the packaging for some Prima Flowers I bought at Michael's. I loved the color combo on it and felt it would make a great book mark... but it turned into a wall hanging! LOL! So I covered my wood base with Bazzill Chocolate textured card stock, then layered on a lighter shade that I had lightly stamped with the floral image from the Mom set with Adirondack Latte ink. I mounted the Prima packaging piece onto a piece of teal cs from my stash, and hand cut the corners to match the Prima piece. I added an assortment of Primas, and pearls from ZVA Creative. The lace is from my Christmas Tree decorations from years ago when I used to add lace bows to many branches. Now I have lots of it for other things! I added some sheer May Arts ribbon and done. I had fun with this... I really enjoy altering things! I especially love it when I find ways to re-use things! I hope you enjoyed this little project! This week's sponsor is Sofpencil Digital Stamps. $15.00 Gift Certificate to her store! I hope you will play along with us this week! To be entered in the drawing, your card must be linked to Mr. Linky by 12:00PM PDT (GMT-8) Saturday May 1st. The winner will be chosen by random and will be announced on Tues. 3rd. Please be sure to make your link direct to your project, not just your blog or gallery, and please place a link to Stampin Sisters in Christ in your post! I can't wait to see your creations! May God bless your week ahead and thanks for stopping by! I love knowing you were here! This is beautiful as all your creations are. I visit your blog daily as I found it through Our Daily Bread stamps. I would really like to listen to your playlist but can't seem to turn it on , do you have any ideas what I could do ? Thanks for all your inspiration from a grateful reader in Europe! This is gorgeous Grace!! I just love your stunning wall hanging with the flowers, pearls, and the vintage flair. What a beautiful verse and definitely worthy of framing!! Awesome take on today's challenge my friend! Hi Susan! Thanks for the sweet comment... as for the music... if you are using Explorer for your browser, it should come on automatically unless you have your sound turned off. If you are using Firefox you have to scroll all the way to the bottom of the page and then it will come on automatically and you can scroll back up to the post. Hope this helps! Thanks for stopping so often and thanks for leaving a comment! I appreciate it! So pretty! 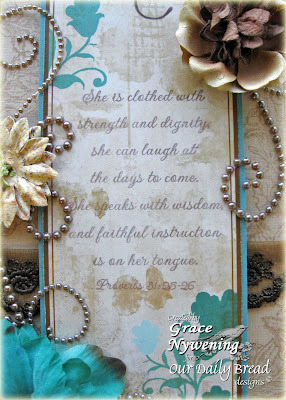 The scripture is wondeful for this Wall hanging. Thank you for sharing this with us this week at Sew Many Cards Challenge. Beautiful wall hanging Grace! Love your colors, verse and of course all the lovely BLING! *Ü* Have a beautiful Sunday!! WOW! Grace this is amazing and stunning!!! The detail is spectacular! How special the person much be to receive a gift like this!! She will LOVE IT!!! Thanks so much for joining us this week at Sew Many Challenges! Awh Grace, I, too, have a mother in heaven. Whomever receives this will be blessed by the time and effort given her. I love the color of your cabinets. I don't have any leftover pieces myself but do you think anyone would miss my kick plate so that I can CASE this wonderful art creation? Have a wonderful week! Delightful! Any mom would love this in her home! The ZVA swirls are awesome! You "green" girl, you! Love that you were able to used so many recyclables. Oh My! Your FAB creation is just so rich! In everything! Colors, embellies, the entire Mom craft is so well, Gorgeous! I like that is is mounted on wood! Great idea! Thank you for joining us for this weeks "Sew Many Cards Challenge“! I look forward to seeing more of your SUPER FABULOUS crafty works in the future! I invite you to hop on over and celebrate my DT positions with me by entering in my candy giveaway! Ends May 17th! Ohhhh wowwww Grace,what a beautiful cards,i love your images and colours. So gorgeous papers and details. Absolutely elegantly beautiful! And I don't think I've told you, my youngest daughter's middle name is Grace . . . random thought there. What a great idea to make a wall hanging, a lovely tribute to moms. Fabulous card! You did a fantastic job! Thank you for playing with us at SMC Challenges! Your blog has been on my favorites list for quite some time and I always love coming to see what you have made!!! This is incredibly BEAUTIFUL!!! The details you add are just gorgeous!! Love it!! Thanks for sharing with us at SMC!!! What a beautiful creation!! Just stunning!! Thanks for sharing with Die Cuts R Us! This is over the moon gorgeous, Grace! What a work of art. I know it will be treasured forever. This is such a beautiful wall hanging. I am sure the recipient will cherish it. I love the colors! *GASP* Stunning Grace!!! What an incredible idea - gorgeous use of colours and love all the flowers and bling!!! Goodness, Grace, this is gorgeous! I love that scripture! I confess I've never heard it before. I'm writing it down! Why do I never think of myself as a mother when I read these things? I only think of my own mother. Thanks for being such a blessing to us at SSCC... and to me. This is amazing, Grace! Love the dimension from the flowers and embellishments! How beautiful, Grace! I'm so glad you joined us for the Clearly Inspired Challenge!! This is stunning..Love the colors and love these flowers, love the lace :) you always have such great details on your cards. Oh, wow. Your creations are always beautiful, but I think this one is especially gorgeous! I love the colors and the verse, the roses and flourishes! It's incredible! Your color combinations here are stunning...I love your wall hanging and how it was inspired!! So elegantly embellished as well, thanks so much for sharing!! Positively fabulous. Such a lovely piece of artwork, sure to be a treasured keepsake. I really love the colors and all those yummy pearl flourishes! Great job on the blossoms challenge. So happy you could have some fun with Our Creative Corner this week! Very pretty, thanks for joining us at the OCC! Mother's day is a tough day for me.. I love being a mom on this day but miss my own mom.. This is such a pretty wall hanging.. I love the way you used your flowers..Great job.. Elegant Paper Fan and News! Hand Made Flowers... and the cure for anxiety! Happy Birthday Candace! A BD Blog Hop! ODBD April Release and some April Fool's Fun!